It’s the 100th anniversary of the Christmas Truce of WWI. 100 years ago, on Christmas Day, 1914, in the middle of World War I, British and German soldiers put down their guns and stopped killing one another. The terrible industrial slaughter had already taken the lives of hundreds of thousands of young men. But on that day, thousands of troops climbed out of the trenches in France and Belgium, sang Christmas carols, and exchanged food, gifts, and souvenirs. They traded German beer for British rum. They even played soccer. It’s a unique event in the history of modern warfare. It’s unique in another way. Those who fought in wars—“the fallen”—are regularly remembered and honored, but remembering and honoring those who refused to fight is pretty much unheard of (except for commemorations sponsored by pacifist and anti-war groups). And yet, this season, the Christmas Truce of 1914 is being commemorated officially, especially in Europe, with a wide variety of government-sponsored memorial events. What is it about this refusal to fight that makes it safe to be officially commemorated? 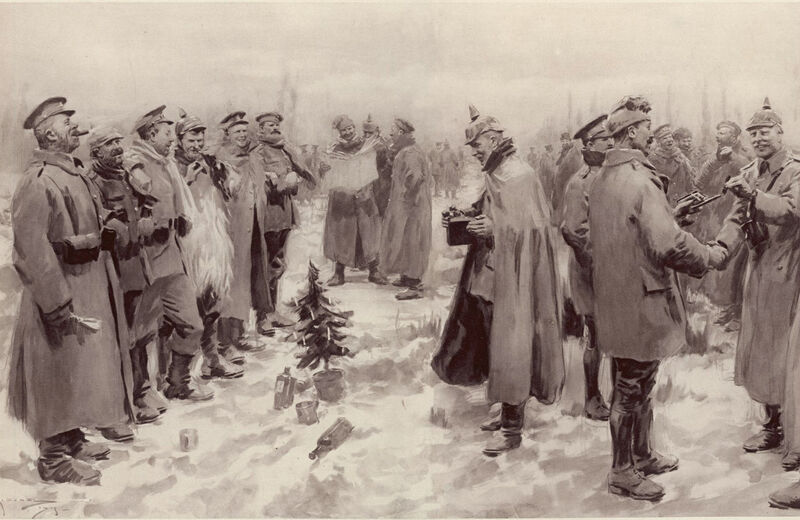 “I’m curious about that,” said Hochschild, who wrote about the Christmas Truce for TomDispatch. “First of all, the Christmas Truce only lasted for a day or two. The war in its full fury resumed very quickly—and went on for another four years. Finally, Hochschild says, we ought to celebrate the anti-war leaders who opposed the war from the beginning and paid a heavy price: in Germany, Rosa Luxemburg spent more than two years in prison for opposing the war; in Britain, Bertrand Russell served six months in a London jail for his anti-war advocacy. And in the United States, Eugene V. Debs was imprisoned for urging resistance to the draft; he was still in the Atlanta federal penitentiary in 1920, two years after the war ended.